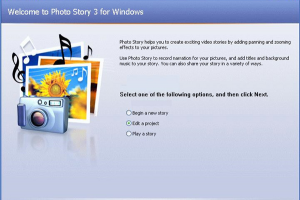 "Create your own photo presentation with this program"
Microsoft Photo Story is an application that allows you to create your own photo presentation and save it as a video file. It has a simple and easy-to-use interface, that uses the same style as a step-by-step wizard. This will guide you through the process of making your presentation. To make your photo slide-show, you simply drag the images you want to use and arrange them in the order in which you want them to appear. Microsoft Photo Story has features that you can use for your presentation. It has some simple editing tools that enable you to crop, rotate, correct the colours and red eye of your images. It has a preview windows where you can check your slide-show and the program allows you to add as many photos as you want. One of the most impressive features of Microsoft Photo Story, is that it allows you to make your own custom sound track. You can use this as background music for your presentation. When you have finished your project, the program will save the file in the WMV format.